Summary of today’s show: For the Mother of Christ, Advent was not a time of Christmas shopping and baking, but the difficult last month of pregnancy made more difficult by a donkey-back ride through hard lands to a strange town to give birth in a stable to the Son of God. How can Mary’s experience of Advent enrich our own experience now? Scot Landry and Fr. Mark O’Connell are joined by Sr. Olga Yaqob and Susan Horne to consider Mary as the Woman of Advent in joyful expectation and anticipation with “immensity cloistered in thy dear womb”, as the poet John Donne said. 1st segment: Fr. Mark talked about his experience of the new translation of the Mass. He said it takes him back to when he was first ordained when he had to very carefully read every word and pay attention to pages. He said it also surprised him the first time he heard “And with your spirit”. He doesn’t feel that he’s praying the Mass yet. He’s achieving validity, but it will take some time to get comfortable enough to enter into deep prayer. 2nd segment: Scot and Fr. Mark welcomed back Sr. Olga and Susan Horne. Sr. Olga said the Holy Family and Nazareth in Christmas are close to her heart as one of the new community of women, the Daughters of Mary of Nazareth. Susan is a director of religious education at St. Joseph, Needham. She’s also a student in the Masters of Arts in Ministry program at the Theological Institute for the New Evangelization and a student of Fr. Mark. Susan is new in her job as DRE and Scot asked her what it’s like to be DRE at one of the largest parishes in the Archdiocese. She’s surprised by the variety of tasks she has to do and the variety of people she encounters and has gotten to know in the parish. These are about 900 students in religious education students in the parish. Scot said Sr. Olga has a special devotion to the Blessed Mother and St. Joseph. Her new community os Daughters of Mary of Nazareth and her new convent is St. Joseph’s Convent. It was her idea to enter into the season of Advent by examining it through Mary’s eyes and later this month, through St. Joseph’s eyes. Sr. Olga said we have seen Christmas as a season of joy and celebration, even a season of adoration, like the Magi coming to adore the Christ Child. We get a glimpse of what Mary and Joseph truly lived in their experience. As a woman, knowing many women who have had babies, she wonders how Mary lived those last few weeks before giving birth to the Son of God, praying and anticipating and thinking of her son as the hope of her people, Israel. She felt a sense of responsibility. Sr. Olga said there is so much too learn from her in these last weeks of Advent. Susan said in pregnancy, in the last month, you begin nesting, preparing the home and the nursery. Susan thinks of Mary having to leave the nest and go someplace foreign to her to have the baby. Scot said each of his three children came after their due date like 705 of firstborns. In that time after the due date, there is the expectant hope for the child. “Come on already.” At the same time, the Israelites waited a thousand years for their Messiah, like expectant parents themselves. Sr. Olga said with her own mother, she learned from her how to receive Communion with the motherly desire waiting to hold her child. With a young woman she was with who gave birth, as soon as the baby was born, the woman wanted to hold the baby and just to touch his skin. When she goes to Communion, she longs to touch Christ and to receive him. Mary helps her to remain in Communion with Christ. She asks Mary to help her receive Jesus through Mary’s Immaculate Heart. Susan thought of expectant wonder. What will this baby bring? As the baby grows within, the mother wonders, what will this person become like? Fr. Mark always enjoys the first Sunday after First Communion to see how the children continue to receive Christ with such wonder and reverence. 3rd segment: Fr. Mark began the segment by reading the John Donne poem. He loves the first line, but the last line gives him pause to think of how it must have hurt her to know Herod pursued her son and how other children were dying by Herod’s hand. Sr. Olga said what was the feeling of Mary that right after the experience of the Annunciatiomn, the angel departed from her and never appeared to her again. Instead the angel only appeared to Joseph, telling him to marry Mary, to take her and Jesus to Egypt, then to come back to Israel. She said Mary never questioned Joseph, to ask why the angel only appeared to him. She was obedient. then think of her traveling nine months pregnant through a desert to Bethlehem. She suffered and continued to suffer through Christ’s passion. Scot said the preparations for your first child are out of control. He went to the hospital a month before the birth and meet all the possible doctors who will be on call, you practice the route, you pack the go bag, you know the phone tree you will call. But here’s the Blessed Mother who doesn’t know where she will give birth.She and Joseph were just looking for a place to lay down after a long journey. Susan said we don’t often think of the day to day elements of Mary’s journeys that help women live their lives as Christian women even better. Meditating on Mary’s life helps her to deal with difficult situations. As a mother, the last thing you want is for your child to be endangered or suffering. She would take the place of her child on the cross. So Mary must have held this pain inside her, knowing this was God’s plan for her family. Fr. Mark told a story of a parish’s Christmas pageant. One boy wanted to be Joseph, but was made innkeeper #2 instead and that made him upset. So when Mary and Joseph came to him, he said, “Sure we have room, come on in.” Connecting to the idea of having no place to give birth while carrying the Son of God, that must have been awful for Mary and Joseph. Scot said Advent helps us to prepare for Christ’s coming in our lives and to prepare for His Second Coming, buy it also teaches us how to deal with waiting for something in our lives. 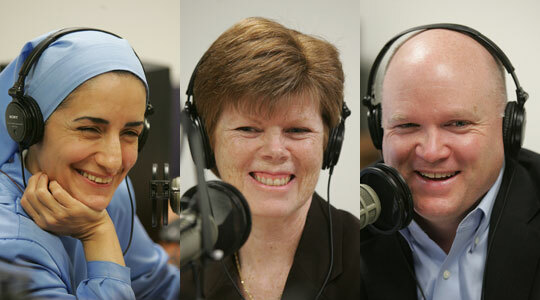 4th segment: Scot asked Sr. Olga how we can become a living Nativity. She said that we need to be that “inn” for Mary and Jesus. We see people around us who need help, a smile, a word of encouragement, or other simple things. Those little gestures are like making an inn for Jesus, making room for Mary. She is present in every person and we are called to see him in one another. You don’t need to study theology or be a leader in the Church. We are all called to be that living Nativity in the world in those daily simple acts of kindness and charity and sincere love. There are further actions we can do: There are people who cannot afford to celebrate Christmas, or a father or mother are serving overseas, or a parent is in the hospital and can’t do Christmas shopping. We can become that living Nativity to people around us. Sr. Olga said a lot of it is being that living example. susan said one thing that helps her is trying to see another person or situation the way God sees it because we don’t know what’s in the heart of someone. It’s easy to judge. We need to see and hear with the eyes and ears of God. Scot said Archbishop Timothy Dolan wrote a book of Advent reflections, Advent Reflections: Come, Lord Jesus . Scot read a passage from the book, relating people in waiting in anticipation of a difficult situation, that this is Advent for them. Sr. Olga said the book has helped her to pray with Mary and live her ministry through Mary in the service to the people around her. He rexample is in her docile willingness, her belief, and her faith. It’s amazing she went through that. From the moment of the Annunciation to the first miracle of Cana was almost 30 years and almost her whole life was Advent, waiting for the Messiah to come into His own. Susan said in the midst of all the stress and work of preparing for Christmas we should recall the Blessed Mother’s example in turning over all her stress and worries to God. We can offer up those tasks, the extra things were doing above and beyond normal life, to God as an Advent sacrifice. Scot said he often prays for the gift of patience. It’s so easy to grow impatient and how we respond to it is through God’s grace. Sr. Olga said she learned from Mary that patience is the fruit of trust in God. If I trust in God, I will remember that God gave his only begotten Son to us, When we worry, we have to remember to trust in his plan that what is meant for you will come to you. Do we think that the one who gave us his only begotten Son will hold anything back from us? Scot said so much of the spiritual is being “all in” for God and here John the Baptist is all in for God. You couldn’t help but notice the messenger sent ahead of his Son. Sr. Olga said what she likes about St. John here is knowing his mission in preparing the way. Often in ministry, we can say, it’s my mission, but John knows he’s just here to lead others to Jesus. He’s full of fiery zeal, but also profound humility. Susan said he also does it with great joy, right from the moment in Elizabeth’s womb when he leaped at hearing Mary’s greeting. Fr. Mark talked about the two aspects of God in the image of his arm. It’s a strong arm, but it also holds the lamb. St. John is a bit crazy, but he’s incredibly strong and bold. He’s completely committed. He hasn’t forgotten what Isaiah’s time was like and how the people lived by Isaiah’s promise. He wants to proclaim it to the world until Christ comes, then he steps back and lets Christ take the center stage. Scot asked how we make straight the paths to prepare for the coming of Christ into our own hearts. As John the Baptist was baptizing people in the Jordan, they were acknowledging their sins. So we make straight the way for Jesus into our hearts, we go to Confession. Sr. Olga asks Mary to help her prepare the way and her heart to bring Christ in. During Advent, Sr. Olga also tries to console Mary in the week’s before giving birth, for her what she went through in the last weeks. Offer sacrifices, prayer, and fasting to console the heart of Mary. Susan said John the Baptist and Mary didn’t feel worthy to receive Christ, but we welcome him. Scot mentioned the Pilot article about the new community Cardinal Seán asked Sr. Olga to found and the Mass coming up next week at the Cathedral of the Holy Cross. She extends an invitation to everyone in the Archdiocese to come, because she like John the Baptist she has a fiery zeal for Christ in her heart and wants to prepare the way for the people of our Archdiocese to know how alive the Church is in our youth.